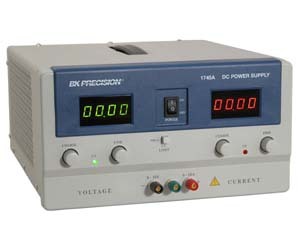 B+K Precision model 1745A is a 0 to 35V, 0 to 10A DC Power Supply. This power supply has all of the great features and performance you would expect from a B+K Precision power supply. One of these features is the four digit LED disply that allows you to see 10mV and 1mA resolution. Another great feature is the output shorting button that allows the user to short the output terminals to set the current limit.